Step one: Empty and clean out your soup can. Remove label. 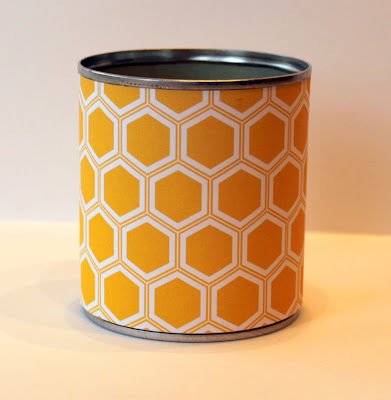 Step two: Measure height of can and cut a strip of patterned paper to wrap around can. 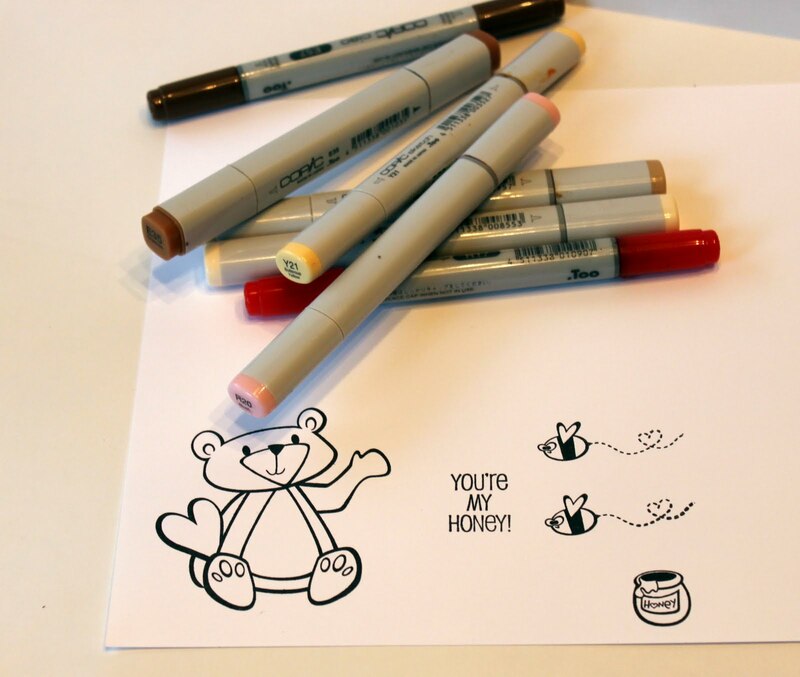 Step five: Color the bear, bees and honey pot. I used Copic markers to color my images. 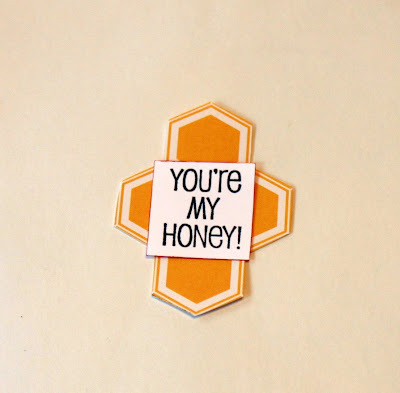 Step eight: Cut a section of the patterned paper to use under the sentiment. I cut along the pattern so that I kept the honeycomb shape. 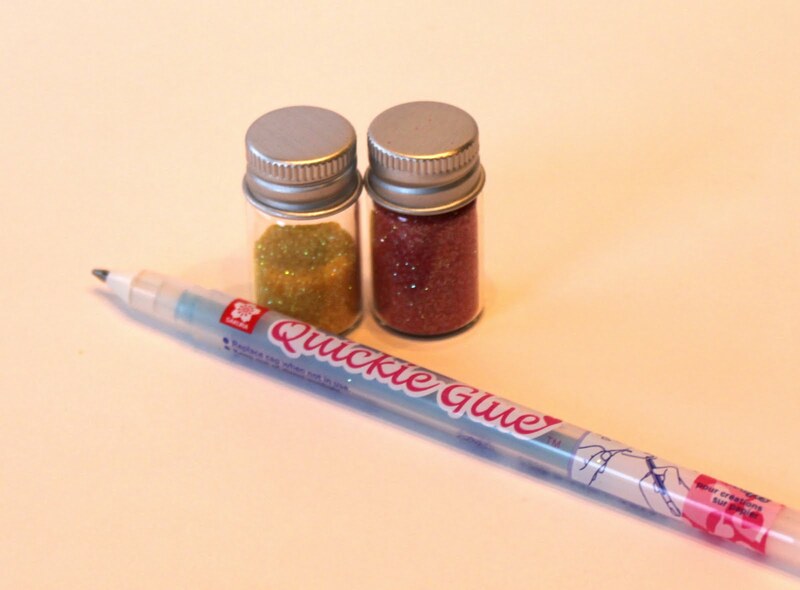 Step ten: Adhere a bee to the end of the wire with a glue dot and manipulate the wire until you get the desired flight path for the bee. Adhere under sentiment panel with a glue dot. Step eleven: I filled the container with a bag of candy hearts and tied it with a bow. Clip the sentiment onto the bow using a mini clothespin. 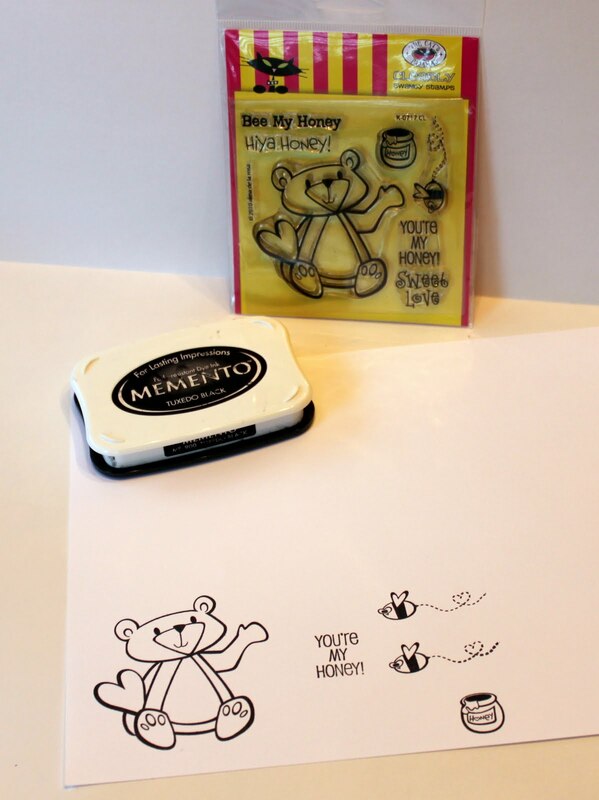 Step twelve: Repeat steps nine and ten to add a flying bee to the bear image as shown below. Attach bear image to can. 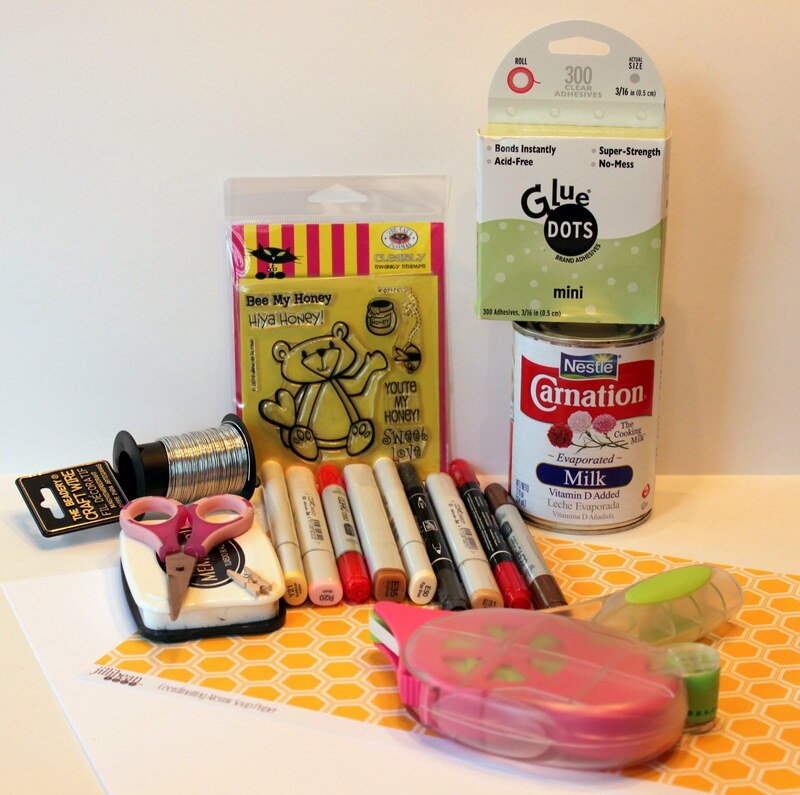 Step thirteen: (Optional) Add some glitter to the little hearts on the bee and to the honey on the honey pot. Finished! 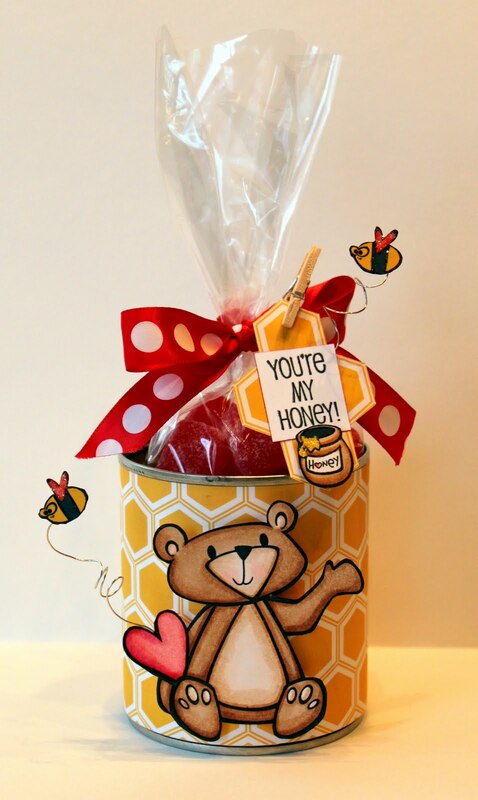 Now you have an adorable Valentine treat container to surprise someone you love with on Valentine's Day! Totally cute, Cammie! 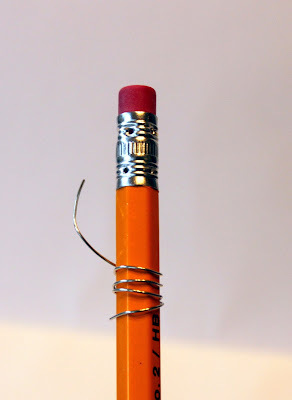 Love this idea for recycling. Do you do anything to the lip of the can for the sharp edge? 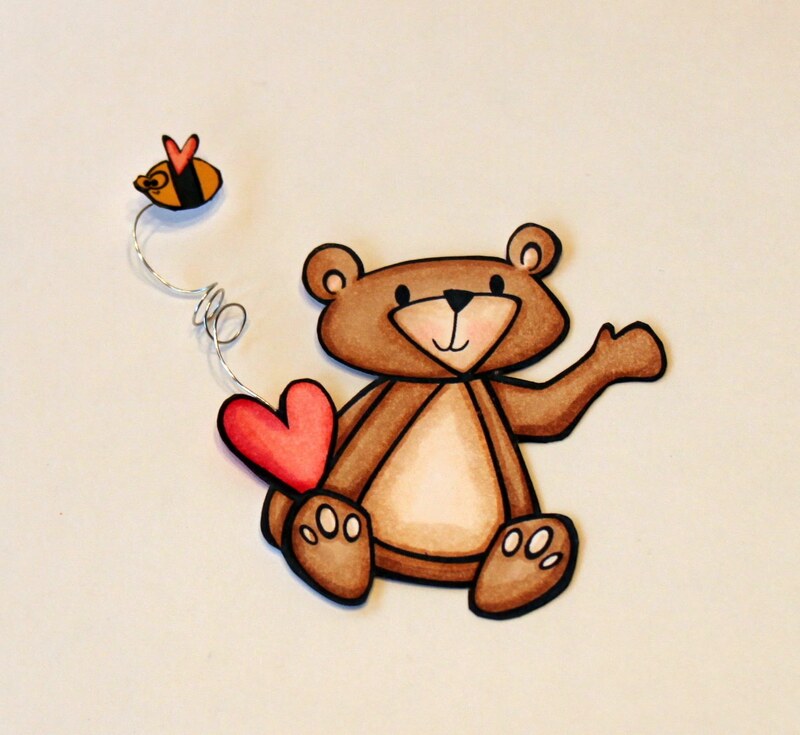 I love the idea of adding the little bees on the wire! Hope the storm missed you but it does look like Texas got a little chilly. Donna- I used a can opener that doesn't leave a sharp edge (Pampered Chef) so it was not an issue. This is so cute! Thanks for the tutorial. 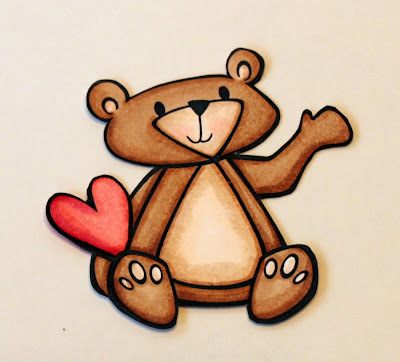 Super cute bear, thanks for the tute! Bear cute is right!!! LOVE it! Cammie - this is adorable! I so love your coloring, and the wire holding the bumblebee on! I bought a Pampered Chef type can opener at Wal-Mart a while back for my cans - works great - about $8!!! NO Way! This is GORGEOUS Cammie!! 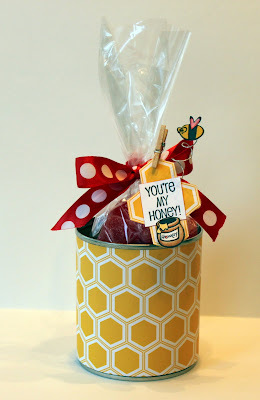 LOVE the tutorial and the little bee on the wire!!! AMAZING! This is SO cute!! 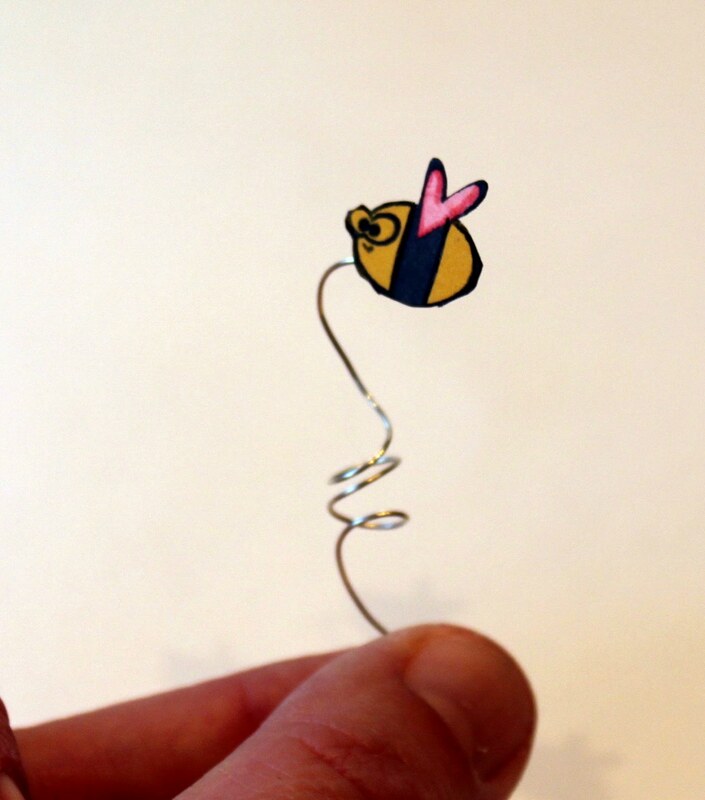 That paper is perfect, and the wire on the bees is just too fun! Camster -- you KNOW how much it pains me to say this, but this is... GENIUS! :) Miss you, dork. This is BEAR-Y DELICIOUS, Miss Cammie. Alma gave me a little peek so I oohed and aahed plenty!! Oh. My. Word. This one will definitely be cased. You are brilliant, Cammie. So cute! Thanks for the great instructions too! 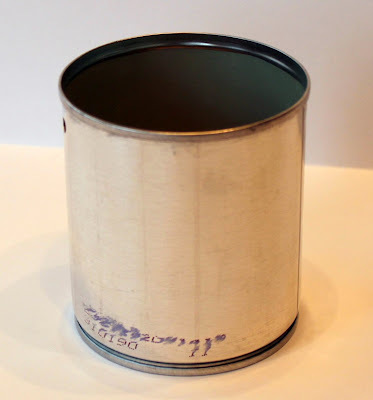 Do you do anything to the inside of the soup can where the opener leaves that sharp spot? 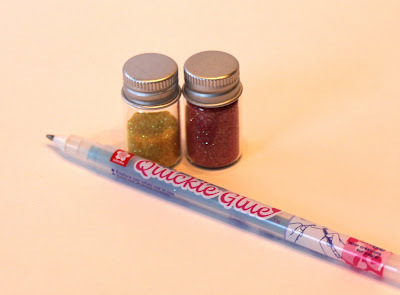 You are so darn talented, clever and generous for showing us HOW to make this sweet ditty! So super sweet and awesome! It would have worked, but a smooth one would be better. I'll get one made yet! That is just ADORABLE Cammie-- Great inspiration! So adorable...that paper is perfect with this project! Thanks for the step by step too! so so cute, great project, thanks for sharing. 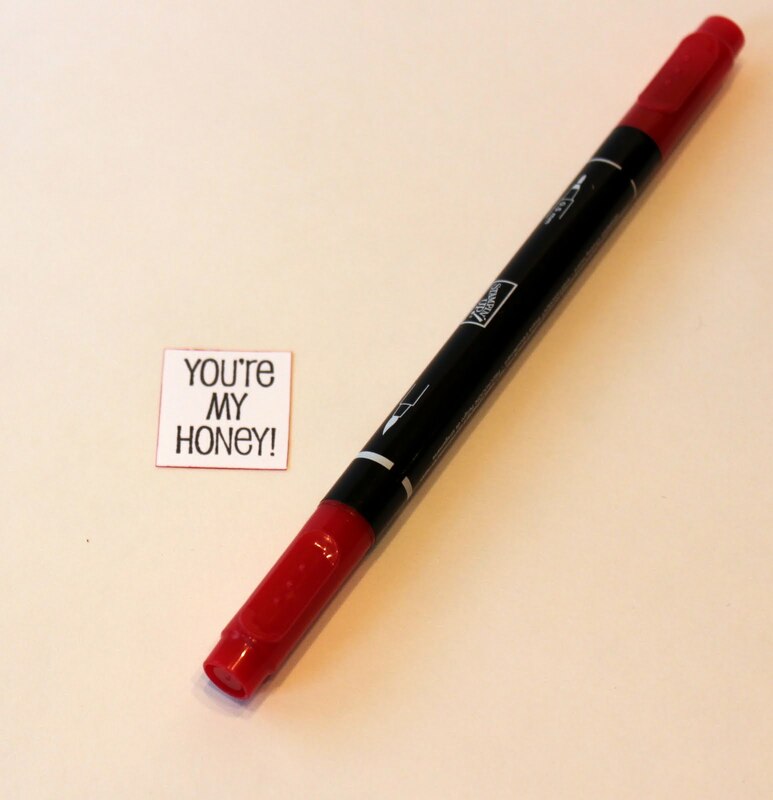 Wish I had some of those great markers and stamps. This is the cutest thing ever! Thanks so much for sharing the idea and how you made it. 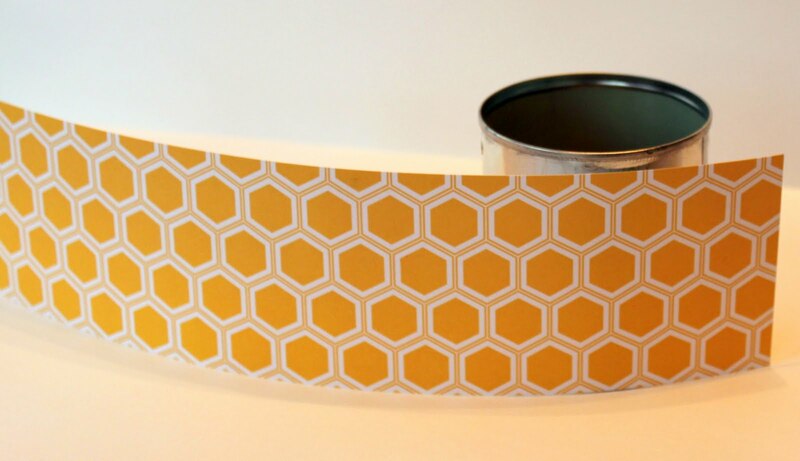 those little bees are so stinkin cute! !